St. George is the patron saint of England. 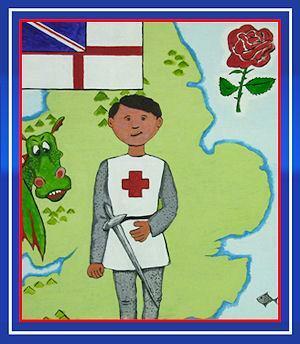 His emblem, a red cross on a white background, is the flag of England and part of the British flag. St George's emblem was adopted by Richard The Lion Heart and brought to England in the 12th century. The king's soldiers wore it on their tunics to avoid confusion in battle. St. George's Day is celebrated on 23 April.